I listened to a talk a while ago by Mooji that really stuck with me. He said to imagine you’re at the symphony, listening to a beautiful piece of music. If you were asked to hone in on just the violins, you could, in spite of the other instruments. At first it would take a little effort to bring the violins into focus, but then, with just a little attention, you could keep them in the foreground of the orchestra. To hear the violins, you wouldn’t have to silence the cellos or the clarinets. You wouldn’t even have to tell the rude people sitting next to you to shut up, you’d just have to place your attention, your awareness on the violins. Simple. Your purpose in every moment is to find and listen to the ‘violins,’ aka the Silence, that’s always available even when the cellos, clarinets, and rude audience members (thoughts, feelings and circumstances) are raging. This Silence is always present... IT is Presence. 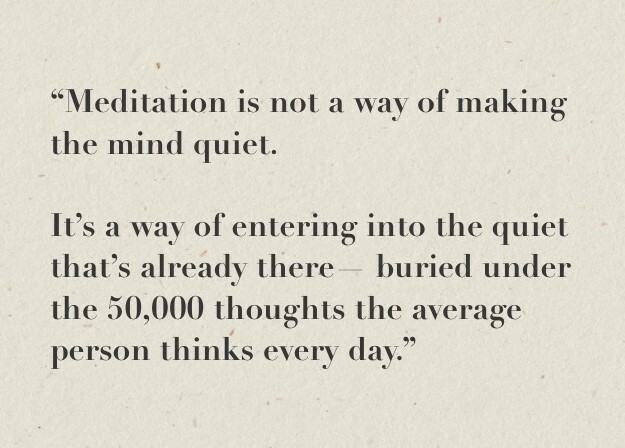 I still have a ‘formal ‘meditation practice, but in the last few years, my life has become meditation. At first I could only find the silence while I was seated with my eyes closed. Gradually, the Silence grew louder and became a permanent fixture in every moment (it always was... it just became so consciously). I’m always aware of this Silence, now, even during the most heated debates, or when I’m on the phone with the cops because our whole car just got stolen (my life last week... we got it back too!!! ), or when my thoughts are racing... IT’s always there, waiting to be re-cognized. And it’s not just Silence. IT’s a quiet that feels like love, peace, joy... happy for no reason. It’s like a hella solid, felt-faith where you just know that everything is always, already alright.